Ovarian cancer is not the most common form of cancer, but it's among the deadliest. That's because about 70 percent of cases recur. A new study by researchers at the University of Pittsburgh, UPMC Hillman Cancer Center, Magee-Womens Research Institute (MWRI) and several other collaborating institutions targets the root of recurrence with new drugs aimed at annihilating stem-like ovarian cancer cells. "You can think of stem-like cells as seeds. They put down roots and grow into a plant," said Ronald Buckanovich, M.D., Ph.D., professor of medicine at Pitt, director of the Ovarian Cancer Center of Excellence at MWRI, and co-director of the Women's Cancer Research Center. "I especially like the dandelion analogy. When we treat cancer, we're essentially mowing the lawn. But the problem is that dandelions always come back." Chemotherapy kills 90 to 99 percent of cancer cells, but because it leaves the stem-like cells behind, the cancer can come back. All it takes is 11 stem-like cancer cells to form a tumor, Buckanovich said. By comparison, it's possible to transplant 50,000 non-stem-like cancer cells and not get a tumor. Buckanovich's drug, 673A, kills these stem-like cells by targeting the ALDH pathway, which the cells rely on to clear the toxins they produce by multiplying so quickly. 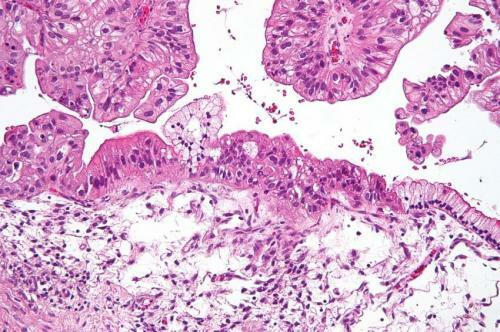 Treating an ovarian cancer with 673A kills only about 3 to 5 percent of the cells, but since they're the stem-like cells, that turns out to pack a punch. And, Buckanovich added, it's not toxic at all to the mice. But Buckanovich cautions that more work must done before 673A is ready for market. Right now, it doesn't last long in the body, and it needs better solubility. It also has yet to be tested in humans. But, more optimistically, he points out that 673A is 10 times as effective at killing stem-like cells than the previous ALDH inhibitor, and its ability to boost the effectiveness of chemotherapy is really encouraging. "It's like one plus one equals 10," Buckanovich said. "That was really striking to me, how synergistic the two drugs were. That's important because it means you can potentially use lower doses and reduce toxicity for patients."